It's the very last day of year, can you believe it?! I feel like I just hit publish on my first blog post and now here we are again staring at the horizon of a new year ahead. In these last few hours of the 2017, I thought it would be fun to recap my top 5 favorite CY recipes and the top 5 things I learned in my first year of blogging. I selected these 5 based on my personal preference of taste, time to make, and how fun it was to blog! This was one of my first original recipes ever developed, but I didn't actually post it until closer to my birthday in March this year. I still absolutely love this cocktail - it's always a regular for our summer entertaining. I really enjoyed the photo shoot, styling, and blogging of this recipe as well. The first few months of shooting recipes and blogging took a TON of time to learn my style and flow of taking photos. By this recipe, I learned a lot about what back-lighting for cocktails can do, as you can see from the photo above. I was able to enjoy the process better and of course, this wonderful cocktail afterwards. 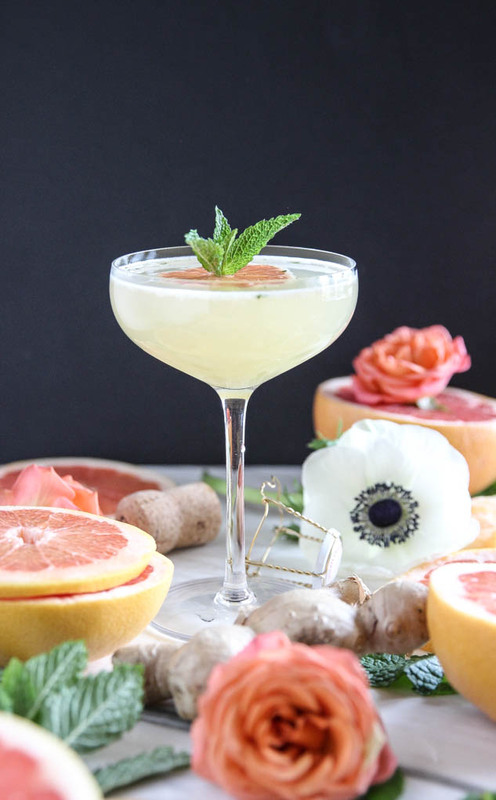 This recipe probably is my #1 favorite cocktail I blogged in 2017. The flavor of the cocktail, the styling, and I remember having a lot of fun with this photo shoot. This photo shoot really set the bar for movement in my photos. In the original post, you can see where I played with a lot of various photo angles and movement. I took overhead shots, straight on, super zoomed in and then action shots where I'm pouring the champagne atop the cocktail. This was one of my most feminine photo shoots with the roses and anemone along side the grapefruit and mint. I loved designing the set and seeing the pictures come to life. The cocktail itself is still my favorite variation of a mimosa and doing this recap is a great reminder for me to make this one more often. Anyone else craving peanut butter + chocolate now? Thanks a lot, Mallory! Gosh, I love these banana bites so much. In the warm weather they are one of my favorite sweet snacks to make in order to prevent me from wanting ice cream every day. I also loved doing this photo shoot because I started to play with various props at this stage of my food blogging journey. 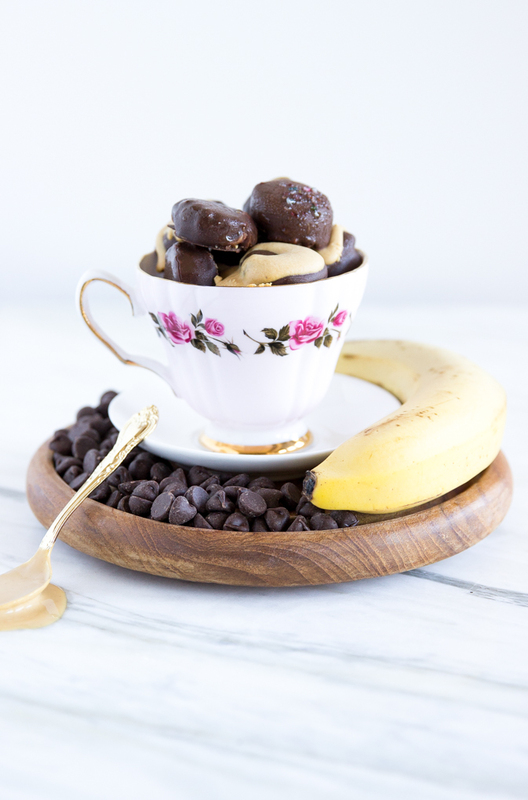 I really enjoyed trying out the vintage teacup and tiny gold spoon to highlight the peanut butter in this recipe. Learning about how props affect the overall mood of the recipe photo was a huge step for me and I started thinking more about how to incorporate props into appropriate recipes posts from this point on. I felt like both an artist and a scientist while making and shooting this recipe! 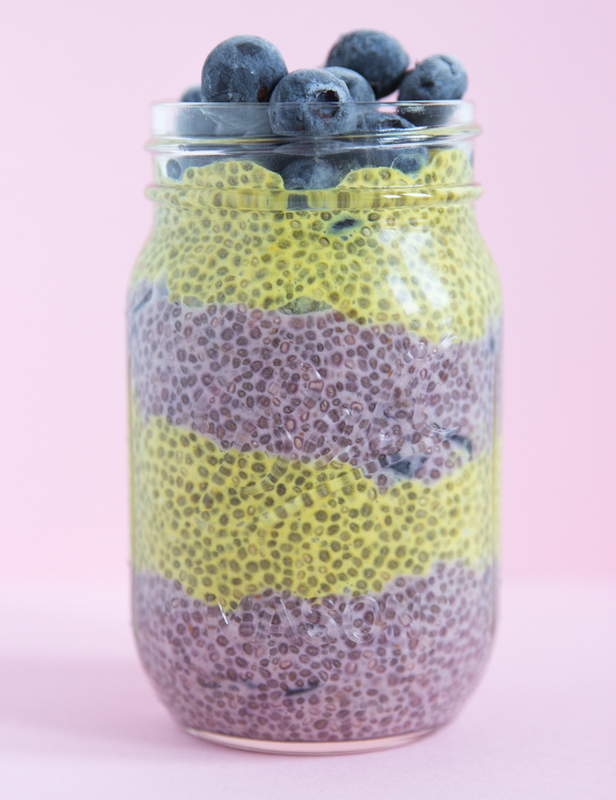 I knew I wanted to make a chia pudding recipe and somehow incorporate turmeric for anti-inflammatory properties, but I wanted it to be pretty and taste good as well. That's when I thought of the wonderful flavor of blueberries and how pretty a purple and golden yellow would go well together. The colors turned out so well that I really wanted the pattern and colors to stand out, so this was one of the first recipes that I didn't include a flower or living element. I'm glad that I didn't though, because I chose to go with this bright, pink backdrop that really lifts the cheery, playful, almost cartoon-like feel of the photos. As for the recipe, I love this pudding a lot. It's especially cool to make for friends or family because they're so impressed with the colors. I brought this to a holiday meal this year and someone made the comment, "How is the recipe with bacon and mayo still the healthiest thing on the table?". Haha! I'm not sure if that was entirely accurate, but it's true that even though this salad does have mayo and turkey bacon, there's lots of vitamins & minerals to be celebrated in here from the broccoli, apples, and pumpkin seeds. This was a special recipe feature because it's a family recipe with a twist that my mother makes ever year during the holidays. Around the late summer into fall this year, I delved into recipe videos, which are really a whole new ballgame as compared to photos alone. They are SO much more work than just taking pictures. Everything from shooting to editing takes longer and requires a lot of attention to detail, but... it was absolutely worth it and I really love making videos. I'm so glad that I was able to document how I make this family recipe and start a YouTube channel! If you haven't taken a peek yet, check it out! 1. Don't get too sucked in - life comes first. Blogging is a TON of fun. I really enjoy creating recipes, taking photos, and bumbling in the buzz to grow and promote my little party over here on the internet. However, there've been times that my creativity and inspiration have been hindered by my obsessed to do better and gain more readers/followers because I'd see how well others would be doing and start comparing myself to them. As I reflect on 2017, my advice to myself and anyone else in the early stages of blogging would be don't get too sucked in. Yes, blogging is a wonderful creative outlet and many people have found enormous success in using it as a business outlet, but remember that everyone's journey is different and there's more than one way to achieve your personal picture of what success is. While we're typing away on the keyboard, taking/editing photos, or engaging in social media, life is still going on all around us. Beautiful moments are happening or challenges arise that require our real-time attention. It's perfectly OK to let the blog take back burner while you're experience or dealing with life. As wonderfully satisfying as blogging is, to me it will never replace real life encounters and experience. 2. March to the beat of your own drum. As mentioned previously, comparing myself to other bloggers never left me feeling good. I'd always ask myself questions like, "Why can't I create something that great?" and "What am I doing wrong?". Instead of being inspired and learning from them, I'd get really down and out. I still struggle with engaging others on social media and on blogs because I will eventually start comparing myself and my work. What I've found helps is to literally say out loud, "That's awesome! Good for them!". It's like you're cheering on a team member instead of playing against them. I've noticed that the most successful bloggers and ones that I enjoy following consistently are focused on their next project and what's going on in their world, versus everything else. That realization was incredibly inspiring to me. Instead of over-analyzing the latest trends and how I can do something similar or better, just keep on track with what makes me happy and I enjoy blogging. That's what it's all about anyway, right? 3. You make the rules. The previous thing I learned lead me to my next big lesson and mantra with blogging: YOU (a.k.a. the blogger) make the rules. In the beginning, I researched a lot of blogging do's and don'ts. I wrote down all these rules like how often to post, what to post, how to use social media, when to use social media, and etc. etc... Finally, when I was about halfway through a year of my blogging journey I thought, why am I killing myself over these rules that aren't even mine or helping me? They were stressing me out and again, limiting my creativity and desire to even blog anymore. Once I took back control and realized that I make the rules of my own blog, the pressure lifted and creativity and motivation struck me almost immediately. Furthermore, my blog and all promotional outlets GREW after that because I was actually creating interesting content again. It's important to remember that you are in charge of your blog. Again, success looks looks different to everyone. At the end of the day, if you don't enjoy doing something, why are you wasting those precious minutes? Planning out posts, recipe photo shoots, and a content calendar is a great idea. I still have an electric calendar + paper planner, daily to-do lists, and use things like Google Drive (I love Google Keep!) and Trello. However, there really is such a thing as over-planning and it's pretty similar to procrastinating. I would sit in front of my planner with my Google & Outlook calendars pulled up and try to plan/schedule out all my blog posts, photo shoots, editing time, research time, and blog misc. to the very minute each week. Unfortunately for me, I would end up trying to solve this large puzzle of fitting everything in perfectly with all the other things I had going on and end up wasting an hour (or more). Even worse, I would sometimes check my schedule before starting a task and realize that it wouldn't fit in based on other things I had going on that day. Instead of just jumping in and getting started with however far I could get on a project, I would end up trying to reschedule it and then stress out over the fact it wouldn't be done "on-time" with my goal I had set. There really is something to the phrase, "the best way to start is to just get started". This is a hard lesson I've had to learn and try to overcome in blogging going forward. 5. The end goal doesn't exist. Did your mind immediately go to this scene in Mean Girls? While your blogging limit certainly doesn't exist, for me, neither does the "end goal". I've had several people ask me, "So, what's your end goal for the blog?" My answer is, the end *goal* for the blog doesn't exist. Again, I think goals are great. It's awesome to have your sights set on a particular milestone, but for me, in the first year of blogging I couldn't answer this question. Quite frankly, I don't know if I'll ever have an answer for that. Here's another daily dose of cliché, but I really do take stock in the phrase "it's about the journey, not the destination". I've noticed my style and enjoyment of blogging morphing and evolving every day. The goal for me even starting a blog was to enjoy the process of creating, photographing, and blogging about good food and sharing my recipes. As I continue blogging in 2018, it'll be interesting to look back and see how my style has further changed and what new lessons I've learned. No matter what, I'll be cheers'ing to the birth of "Cheers Years", this very blog, and all the joy it has brought me over the past year. If you have a blog, or are planning on starting one, what lessons have you learned? Chime in and let me know! Here's to all the creatives out there sharing their passion with the world and learning lessons along the way. Let's keep going in 2018... Cheers!